For 24 years the Ensemble Theatre of Cincinnati has offered up top-notch Off-Broadway theatre performances in historic Over-the-Rhine. 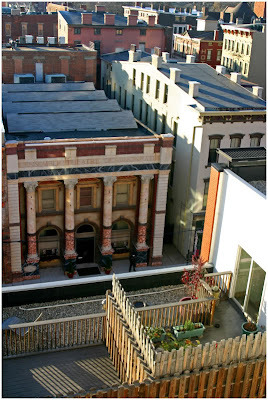 The first two years of performances were held at Memorial Hall on Elm Street near Music Hall until the organization relocated to its space on Vine Street near 12th in the heart of the Gateway Quarter district of Over-the-Rhine. 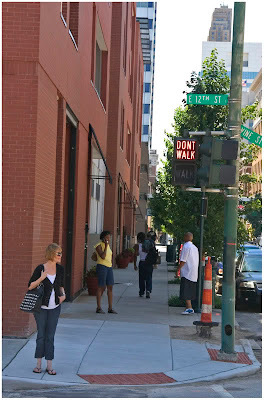 But before there was the now popular Gateway Quarter, the ETC was there bringing in money and visitors to the neighborhood. The ever-growing urban living, retail and entertainment district now has dozens of businesses and hundreds of new residents. 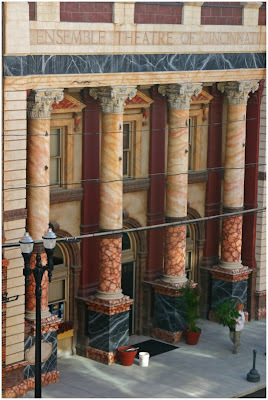 Theatre patrons can now dine at establishment like Lavomatic and Senate, and window shop at the unique collection of locally owned shops along Vine Street surrounding the ETC. Since 1988, ETC has been improving the 106-year-old structure that has been home to a consulate, bank and printing shop before it became the permanent home for ETC. This work has included renovations to the building to make it an appropriate theatre venue early on, and the addition of amenities for theatre personnel and additional seating capacity in the 1990’s. The 191-seat theatre is now at another crucial point in its history as ETC is in the middle of a $6.5 million capital campaign that will help expand the theatre’s presence and improve operations at its existing location. 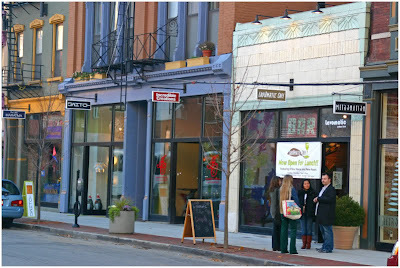 New shops occupy once vacant storefronts along Vine Street [TOP-LEFT]; Mayor Mallory celebrates the completion of a new condominium project at 12th & Republic streets [TOP-RIGHT]; the once desolate Vine Street is now full of foot traffic [LOWER-LEFT]; rooftop decks for new condominiums now overlook the Ensemble Theatre of Cincinnati [LOWER-RIGHT]. The ‘Next Stage’ capital campaign is the first such campaign in the ETC’s history, and comes at a time when the theatre is experiencing solid growth. Over the past two seasons ticket sales have inceased 22 percent, and ETC has more subscribers now than in any time during its history. “It’s an astonishing accomplishment when many theatres across the country are unfortunately seeing a decrease in attendance,” said Jocelyn Meyer, Communications & Development Manager with ETC. 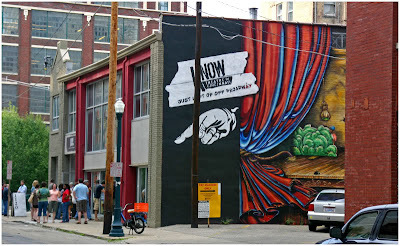 The success of ETC has also helped spawn the creation of growing arts community that includes the Know Theatre, Art Academy of Cincinnati, and Fringe Festival all located right in the heart of Over-the-Rhine and within blocks of ETC. 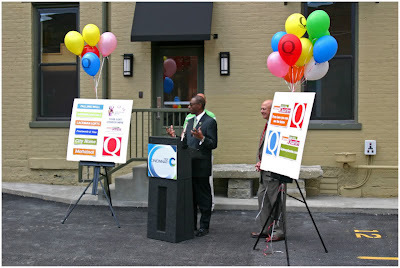 During the course of a season Meyer explained that ETC brings some 35,000 patrons into the historic Over-the-Rhine neighborhood and makes an economic impact of more than $3.5 million in direct spending. But even with strong numbers recently, the ETC is still in need of contributions to help start construction with the Next Stage capital campaign which had originally been projected to complete construction by the fall of 2010. “While ticket sales continue to do phenomenally well for us, like most non-profits, our contributed income has suffered terribly in this economy,” detailed Meyer who went on to say that the ongoing capital project, with the help of Cincinnati-based GBBN Architects, the completed ETC capital project will add 15,000 square feet of space to the ETC’s existing facilities and strengthen its neighborhood presence. 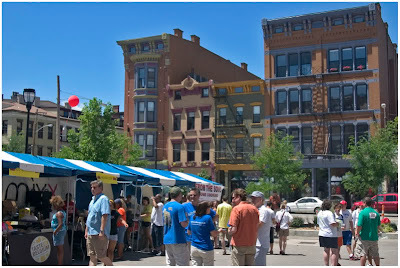 The Know Theatre draws additional theatre crowds to the Gateway Quarter district of Over-the-Rhine [LEFT], while festivals like the Gateway Summer Celebration have formed to celebrate the residents, businesses, and history of the neighborhood [RIGHT]. In total, the capital project will result in a renovated performance space and seating, an outside courtyard, an on-site scene shop, new office space for administrative staff, a renovated box office and lobby space, and a private meeting room for sponsors, entertainment, and rentals. According to theatre officials, the renovations will also put a strong emphasis on creating a more accessible seating area for mobility-challenged patrons, and will maintain the current intimate theatre setting for which the ETC is known. Those interested and able in giving to the ETC are able to do so by donating online; mailing a check made payable to “Ensemble Theatre of Cincinnati” to 1127 Vine Street, Cincinnati, Ohio 45202; or by calling (513) 421-3555.